Major General David S. Baldwin was appointed as The Adjutant General of California on 16 April, 2011. As a member of the Governors Cabinet, he is responsible for the operation of the State Military Department which consists of the California Army and Air National Guard, State Military Reserve and California Youth Programs; totaling more than 23,000 personnel. General Baldwin enlisted as a medic in the California Army National Guard in 1982. He was commissioned through Reserve Officers Training Corps in 1984. General Baldwin’s military assignments have included Rifle Platoon Leader, Company Executive Officer, and Scout Platoon Leader. He commanded a rifle company that deployed to the Los Angeles Riots in 1992. General Baldwin served as the aide-de-camp for the Commander, California Army National Guard before being assigned as the Operations Officer and then Executive Officer of 1st Battalion, 184th Infantry. He commanded that same battalion when it deployed troops to Kuwait in the fall of 2001 in support of Operation Desert Spring. Following his assignment as a student at the Army War College, General Baldwin served as the Civil-Military operations Officer and then the Executive Officer of Combined Forces Command – Afghanistan. He also serviced as Commander, 40th Infantry Brigade Combat Team, California Army National Guard. General Baldwin’s full-time assignments on State Active Duty included Emergency Plans and Operations Officer, Legislative Liaison Officer, J3 and Chief of the Joint Staff, California Military Department. Major General Matthew P. Beevers was appointed as Assistant Adjutant General -Army, California National Guard by Governor Edmund G. Brown on 16 April 2011. He provides current and future operational oversight to The Adjutant General for Army and Air National Guard matters in the state of California. General Beevers was commissioned through the Early Commissioning Program at New Mexico Military Institute. During his command, he participated in Operation Garden Plot, the response to the Rodney King verdict civil unrest in Los Angeles. After completion of the Armor Officer Advanced Course, General Beevers served as the Assistant Brigade S3 with 3rd Brigade, 40th Infantry Division (Mechanized). He then served as Operations Officer with the 69th Press Camp Headquarters, deploying with the 69th Press Camp Headquarters to Bosnia – Herzegovina in support of Operation Joint Forge. General Beevers continued to serve in the 69th Press Camp Headquarters as Executive Officer and later as Commander, deploying to Hungary with Task Force Warrior to train and equip the Free Iraqi Forces in the run up to Operation Iraqi Freedom. Upon his return, he was assigned as Executive Officer, 100th Troop Command and later deployed as the Director of Strategic Communications, Combined Forces Command – Afghanistan, Operation Enduring Freedom. General Beevers returned to the 100th Troop Command as Executive Officer and later served as Assistant Chief of Staff, California Army National Guard. Upon completion of Senior Service College, he was assigned as Director, Command, Control, Communications and Computer Systems, J6 and later as Director of Operations, J3, Joint Force Headquarters – California. General Beevers went on to command the 100th Troop Command, California Army National Guard. Chief Master Sergeant Thomas L. James is the Command Senior Enlisted Leader to The Adjutant General of the California National Guard, while stationed at the California Military Department, Sacramento, California. In fulfilling his responsibilities at the highest level of enlisted leadership for the California National Guard, Chief James is responsible for the morale, welfare, training, discipline, recognition, resourcing, and effective mission utilization for over 14,000 enlisted service members throughout the force, including those assigned to the California State Military Reserve and the Youth and Communities Task Force. 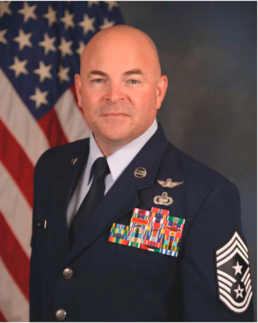 Prior to his assignment, Chief James’ roles and responsibilities included service as Intelligence, Surveillance, and Reconnaissance Squadron Superintendent with the Air Force Reserve while assigned to Deployable Ground Station Two, Beale Air Force Base, a Legislative Liaison with the Office of Federal Policy and Liaison for the California Military Department, and an International Affairs NCO assigned to the California National Guard, Joint Staff. In addition to these assignments, Chief James served in numerous positions as a CH-47D Chinook helicopter maintainer, technical inspector, flight engineer, and flight engineer instructor while serving in the United States Army and the California Army National Guard. His experience in overseas contingencies, humanitarian, and state disaster response include participation in operations DESERT SHIELD, DESERT STORM, RESTORE HOPE, NEW HORIZONS, IRAQI FREEDOM, and Hurricane Katrina Emergency Response. 2008 Associate in Applied Science degree in Communications Applications Technology, Community College of the Air Force, Maxwell AFB, Ala.
2011 Bachelor of Arts, Intelligence Studies, American Military University, Charles Town, W. Va.
2014 Air Force Reserve Command Chief Master Sergeant Orientation Course, Robins AFB, Ga.
2017 Chief Leadership Course, Maxwell AFB, Ala.
November 1986–January 1987, Trainee, Army Basic Training, Ft. Jackson, SC. January 1987–June 1987, Student, Medium Helicopter Repair Course, Ft. Eustis, Va.
June 1987–July 1989, CH-47C/D Repairer, 295th Helicopter Company, Mannheim, Germany. July 1989–February 1993, CH-47D Flight Engineer, C 7/101st Aviation Regiment (Air Assault) Ft. Campbell, Ky.
February 1993–March 1995, CH-47D Flight Engineer, A 5/159th Aviation Regiment, Schwäbisch Hall & Giebelstadt, Germany. March 1995–April 1999, CH-47D Flight Engineer, G Company 140th Aviation Regiment, Stockton, Calif.
April 1999–April 2001, CH-47D Maintenance Supervisor, 1106th Aviation Classification Repair Depot, Fresno, Calif.
April 2001–May 2005, Flight Platoon Sergeant, G Company 140th Aviation Regiment, Stockton, Calif.
April 2004–September 2008, International Affairs NCO, Office of International Affairs, Joint Staff, California National Guard, Sacramento, Calif.
May 2005–March 2006, Aircraft Production Control NCO, 1106th Aviation Classification Repair Depot, Fresno, Calif.
March 2006–January 2010, Network Intelligence Superintendent, 234th Intelligence Squadron, California Air National Guard, Beale AFB, Calif.
Nov 2007–April 2013, Legislative Liaison, Office of Federal Policy and Liaison, California National Guard, Sacramento, Calif.
January 2010 – August 2011, Operations Superintendent, 222d Operations Support Squadron, California Air National Guard, Beale AFB, Calif.
July 2012–April 2013, Operations Superintendent, 222d Operations Support Squadron, California Air National Guard, Beale AFB, Calif.
April 2013–April 2017, Squadron Superintendent, 38th Intelligence Squadron, Beale AFB, Calif.
April 2017–June 2017, Incoming Senior Enlisted Leader to The Adjutant General of the California National Guard transition assignment, Joint Force Headquarters, Sacramento, Calif.
July 2017–Present, Senior Enlisted Leader to The Adjutant General of the California National Guard, Joint Force Headquarters, Sacramento, Calif.